Pay attention. Be astonished. Tell about it. Mary Oliver called these lines "Instructions for life," but they fit my blog intention. 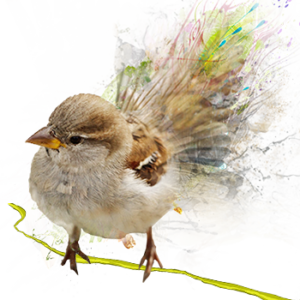 This little “housie” has a fancy tail-do for World Sparrow Day March 20. 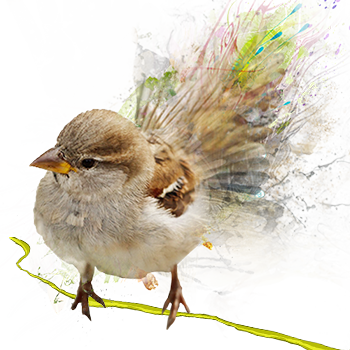 It’s March, have you made plans for World Sparrow Day? House sparrows are a worldwide force, and it seems they have worldwide supporters. International Sparrow Day is March 20, 2018. In 2005, Mohammed Dilawar read about the decline of house sparrows in Great Britain. An ecology student of western India, Dilawar began looking for data to determine whether the same was true in India. Almost no data had been collected. (Most conservationists in India work on endangered tigers.) Since then, Dilawar has launched his own nationwide survey of the house sparrow population and found a serious decline. He distributes house sparrow nest boxes and tries to spread the word. House sparrows have also been declining in America for years, but it took ornithologists quite a while to notice. Even today most birders admit to being happy to hear it. The house sparrow’s biggest flaw is that it is so darned adaptable. It thrives in whatever degraded human environment we can make. House sparrows follow humans around the world, reproduce prolifically, and build messy nests in any cranny they can find. This week, since they stay year-round, house sparrows are busy scouting out nesting territory to get the good spots before other birds return. House sparrows are a threat to native birds that are more particular about habitat, which is about any other bird you can name. Nest cameras confirm that house sparrows are aggressive toward other nesting birds. They move into other birds’ cavities. Then they invade nests of other species to kill baby birds by pecking their skulls, though they never eat them. In the US, the sheer numbers of house sparrows edge out some species as the supply of native habitat declines. We Americans protect our native birds, but we feel little responsibility for house sparrows even though they were intentionally introduced in the mid-19th Century. In those days, many of us were more comfortable with familiar European things. Some New Yorkers imported house sparrows for Central Park, thinking their nestlings would consume more insect pests than native birds did. The first sparrows died before reproducing, so more were introduced. Eventually house sparrows thrived, when streets were full of horses being fed bags of oats. Then cars replaced horses, but sparrows had found human garbage, and they also spread out to farmyards. Throughout the world, house sparrows live always near humans. 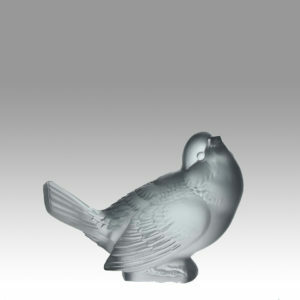 Rene Lalique’s Parisian glass sparrows sell for hundreds of dollars. House sparrows have been in Europe for centuries, though the population was estimated at only 12 million in 1943 while the US population had soared to 150 million. Once here, house sparrow numbers increased without restraint until the population was out of balance with the ecosystem, even in urban America. When causes of the current decline become clear, they may be understood as a natural balancing effect. Partners in Flight estimates that 13% of the global breeding population of 540 million house sparrows is in the U.S. House sparrows rate just an 8 out of 20 on the Continental Concern Scale. Meanwhile in London, the Royal Society for the Protection of Birds (RSPB.org) found only eight sparrows in all of Kensington Gardens during a 2000 survey. They say that causes remain largely undetermined, but house sparrows are down by nearly half in the UK, particularly in urban and suburban environments. Numbers have also declined in rural UK, and the house sparrow is now red-listed as a species of high conservation concern there. 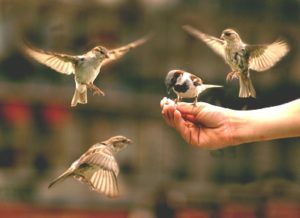 March 20 is the heart of Lent, so perhaps it is time to examine our consciences: aren’t the reasons we care about native birds true also for house sparrows? They eat weed seeds; they feed owls and hawks. And what threatens house sparrows probably indicates something significant about our own habitat. We are as connected to house sparrows as we are to any other elements of our natural world. To assume that they should be ignored – or, worse, eliminated – is as misguided as to assume that nature would somehow be more perfect without Homo sapiens in it. If something is eliminating sparrows, we should find out about it.